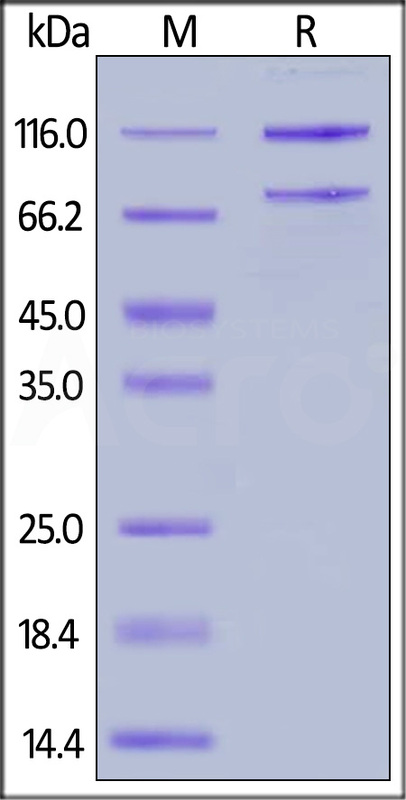 Rat Complement C5, His Tag (CO5-R52H5) is expressed from human 293 cells (HEK293). It contains AA Gln 24 - Ala 1688 (Accession # XP_001079130.2). This protein carries a polyhistidine tag at the C-terminus. The mature form of Complement C5 is a disulfide-linked heterodimer composed of proteolytically cleaved α and β chain. Each α and β chain has a calculated MW of 76.1 kDa (β chain) and 114.8 kDa (α chain). The protein migrates as 70 kDa (β chain) and 110 kDa (α chain) under reducing (R) condition (SDS-PAGE) due to glycosylation. 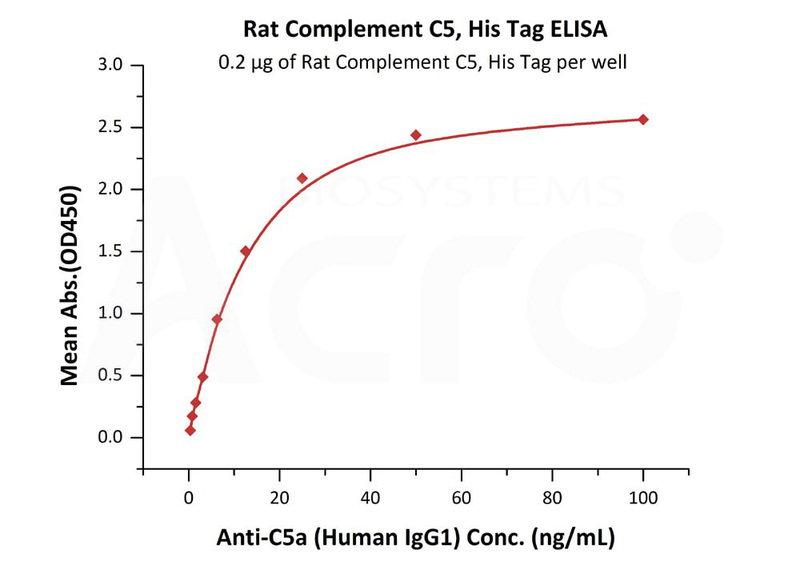 Rat Complement C5, His Tag on SDS-PAGE under reducing (R) condition. The gel was stained overnight with Coomassie Blue. The purity of the protein is greater than 95%. Immobilized Rat Complement C5, His Tag (Cat. No. CO5-R52H5) at 2 μg/mL (100 μL/well) can bind Anti-C5a (Human IgG1) with a linear range of 0.4-12.5 ng/mL (QC tested). Derived from proteolytic degradation of complement C5, C5 anaphylatoxin is a mediator of local inflammatory process. C5 precursor is first processed by the removal of 4 basic residues, forming two chains, beta and alpha, linked by a disulfide bond. C5 convertase activates C5 by cleaving the alpha chain, releasing C5a anaphylatoxin and generating C5b (beta chain + alpha' chain). Activation of C5 by a C5 convertase initiates the spontaneous assembly of the late complement components, C5-C9, into the membrane attack complex. C5b has a transient binding site for C6. The C5b-C6 complex is the foundation upon which the lytic complex is assembled. The C5a anaphylatoxin interacts with C5AR1 and tick complement inhibitor. C5a is also a potent chemokine which stimulates the locomotion of polymorphonuclear leukocytes and directs their migration toward sites of inflammation. (1) DeMartino JA, et al. 1994. J Biol Chem. 269(20):14446-50. (2) Fredslund F, et al. 2008. Nat Immunol. 9(7):753-60. (3) Chen Z, et al. 1998. J Biol Chem. 273(17):10411-9.